"Nevertheless, she persisted" has become a manifesto for female empowerment, and it has also become a #TCTheater company. Founded in 2017, Persistent Theatre Productions is all about "lifting women through untold stories." They do that through their choice of plays (original, classics, or new plays by women) and by hiring women behind the scenes. Their newest production is When We Were Young and Unafraid, which premiered Off-Broadway five years ago. 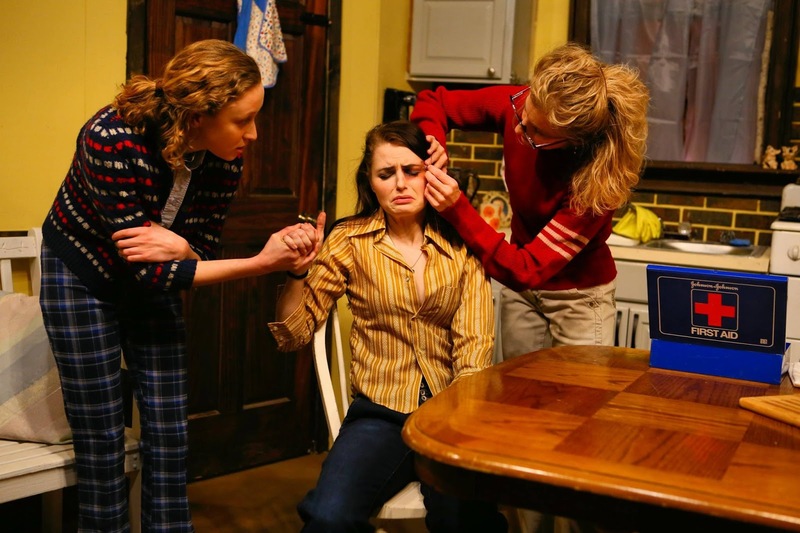 It explores the lives of women and the idea of feminism in the early '70s, a time very different from our own in some ways, but in other ways not so different. The untold story it tells is that of domestic violence, always an important story to tell and to hear. Persistent tells it with a strong cast in an intimate setting that leaves nowhere to hide from the sometimes difficult emotions. Agnes (a no-nonsense Julie Ann Greif) runs a bed and breakfast off the coast of Washington, with a side business of sheltering abused women at a time when women's shelters didn't exist and domestic abuse wasn't talked about. The backstory of how Agnes got into this business comes late in the show (which also explains her heretofore out of place Southern accent), but suffice it to say she has a personal history with abuse. Despite the drama and trauma they encounter, this seems like a normal life for Agnes' smart teenage daughter Penny (an appealing Audrey Parry, believable as a teenager), until Mary Anne (a raw and vulnerable Aidan Jhane Gallivan) arrives to shake things up. She gives Penny advice on how to get the boy she likes to ask her to prom, which basically amounts to: act stupid and play the game. Offering a contrasting viewpoint is lesbian feminist Hannah (a tough and funny Lynda Dahl), who arrives looking for work and a secluded women-only community. The sole male character is B&B guest Paul (an amiable Jared Mogen, until Paul reveals his true colors), whose wife left him after becoming liberated, leaving him longing for a wife, home, children, dog, and all that. When Mary Anne's abusive husband John arrives, Agnes tells her she has to leave for everyone's safety, but Mary Anne has nowhere to go. Like Mad Men's Betty, she jumps from one bad relationship to the next, but women of their times didn't have a whole lot of other options. How do Agnes and Penny move forward from here? 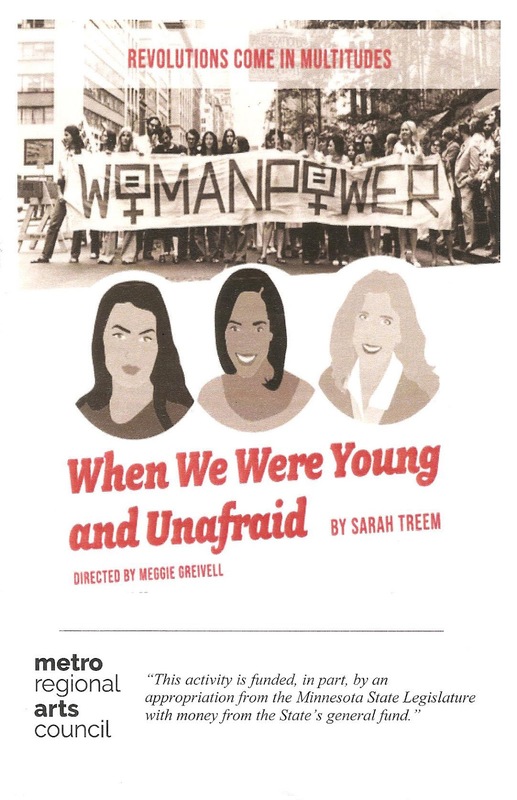 The play brings up some interesting ideas about what feminism, or women's liberation as it was called at the time, means to different women. Spoiler alert: not all women think alike and want the same thing. But the fundamental core of any equal rights movement is equality of choices and opportunity (to bring it back to Mad Men, in my favorite quote of the series Peggy says to her boss/lover as he tells her he's decided their relationship is over, "well aren't you lucky, to have decisions"). The play shows us that when a woman doesn't feel safe in her own home, whether that's with her parents, or siblings, or the man who's supposed to love and protect her above all else, her choices and opportunities for a happy and fulfilling life are severely limited. Jay Beal has designed a detailed and realistic set of the '70s B&B kitchen, which the actors actually use to make coffee and muffins, and drink lots of whiskey. The space at Fallout Urban Arts Center (a different location a block away from their other space where I've seen theater before) is small and intimate, almost uncomfortably close to the action. The scene transitions are at times slow and clunky, dragging down the momentum of the piece. I would have liked more use of music during transitions, because the songs that they do use a few times during transitions and at intermission are great female songs from the time period (Dolly Parton, Karen Carpenter, and more). But on the whole it's a gripping and engaging piece, especially towards the end as the stakes get higher. 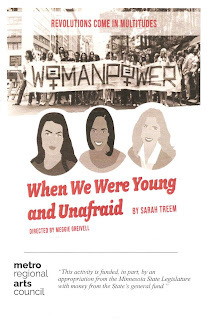 When We Were Young and Unafraid continues through March 31 at Fallout Urban Arts Center in South Minneapolis, near Nicollet and 26th. Get there early to find street parking limited by winter restrictions, and possibly check out one of the many nearby eating and drinking establishments like Bad Waitress Diner or Glam Doll Donuts.